Erin Herbold-Swalwell | Attorneys | Brick Gentry, P.C. Being raised on a family farm and my continued involvement with the farm and experience in the agricultural industry has prepared me to serve my clients. The wealth of experience of the attorneys and staff at Brick Gentry allows me to assist my clients with a wide-range of legal issues. Erin Herbold-Swalwell practices primarily in the areas of agricultural law, estate planning and business succession planning. 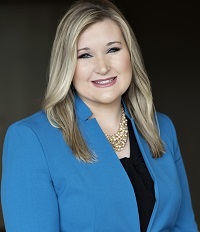 Prior to joining the private practice of law, Erin was the Staff Attorney at the Iowa State University Center for Agricultural Law and Taxation where she assisted farmers and conducted research, writing, and public speaking in several areas of agricultural law. Erin has also served as chair of the Iowa State Bar Association’s Agricultural Law Section. Raised on a family farm near Mingo, Iowa, Erin continues to be involved with farming and agriculture. Erin enjoys giving back to the community and spending time with her family. Attorney with Newbrough Law Firm, Ames, Iowa 2006-2007. Staff Attorney with Iowa State University Center for Agricultural Law and Taxation, Ames, Iowa, 2007-2011. Attorney with Beving, Swanson, and Forrest, P.C. 2011-2015. "Iowa Legislature digs in for busy session; Legal Issues: Top of the list includes water quality, tax reform, livestock issues and the budget shortfall." Wallaces Farmer, January 29, 2018. “How Farm Succession Affects Women in Agriculture” at the Iowa Power Farming Show, February 1, 2018. "Budget cuts will affect farm programs; Legal Issues: Proposed cuts in USDA funding come as farmers are facing their fourth straight year of falling income." Wallaces Farmer, August 25, 2017. "Drainage Districts" for the Iowa State Bar Association's 2017 Environmental Law Seminar, February 17, 2017. Author of monthly column entitled “Farm Legal Issues” published in Wallaces Farmer. University of Iowa College of Law, 2006. Iowa State University, B.A., 2003.